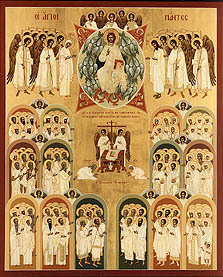 The saints are an important part of the Orthodox Church. Each saint has a feast day, and these are celebrated on a regular schedule throughout the calendar year. 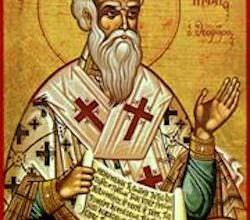 Those who are named after the saints will celebrate their name day on the saint’s feast days. 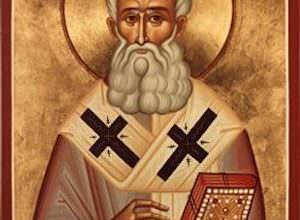 Saint Hilarion was born in Palestine in a place called Tabatha. His parents were pagan and he was also raised into these beliefs. However, when he was a young man he left Palestine for Alexandria to attend school where he found the Christian faith and was baptized. While he was in Alexandria, he learned about Saint Anthony the Great and had the privilege of meeting him and his family. When he saw how Saint Anthony lived, he wanted that kind of life for himself. He eventually did return to Palestine and while he was there, he lived a Christian life of fasting and prayer. Word of his life of prayer started to spread and people would constantly approach him and ask for his prayers. This became overwhelming for him so he decided to return to Egypt to escape them and their requests. He wanted to live a private and quiet. He returned to where Saint Anthony lived but quickly found that he had to move on once again. Once word spread of his life of prayer, people once again sought him out. He moved several times and wherever he went it was the same thing, people would hear of his holy, prayerful life and find him. He lived a full life, which eventually ended during his time in Cyprus. Saint Hilarion’s feast day is on October 21st of each year. Here are the hymns that are sung on this feast day. With the rivers of your tears, you have made the barren desert fertile. Through sighs of sorrow from deep within you, your labors have borne fruit a hundred-fold. By your miracles you have become a light, shining upon the world. O Hilarion, our Holy Father, pray to Christ our God, to save our souls. As we gather on this day, we sing thy praise and acclaim thee as a never-setting light of the bright spiritual Daystar. Those whom ignorance benighted, thou didst illumine with thy beams; and thou dost raise unto the divine heights, O Hilarion, our Father, all them that cry out: Height of ascetics, Rejoice! 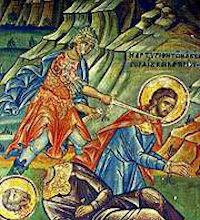 Saint Hilarion is one of the early saints of the Orthodox Christian Church. 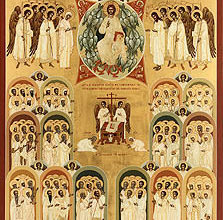 Check the Name Day page for more information about other Orthodox Christian name days.